Wake up to the melodious sounds of twittering birds, chattering squirrels and croaking frogs every morning, and go to bed to the gentle harmony of chirruping crickets as luminous green fireflies dance in the dark. Walk through an acre of garden filled with many tropical fruit trees, lush greenery and crimson flowers and delight as their exotic scent lingers in the air. Gaze over towards the paddy fields at the farmers carefully tending their multi-hued crops. Without any effort this tranquil rural setting magically promotes relaxation. 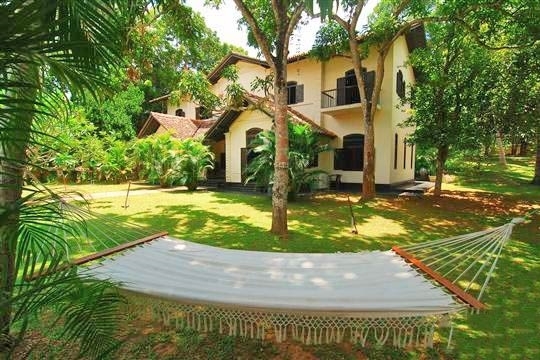 The beautiful five-bedroomed house provides a refuge for tired bodies and minds looking to recharge their batteries in complete peace and quiet. 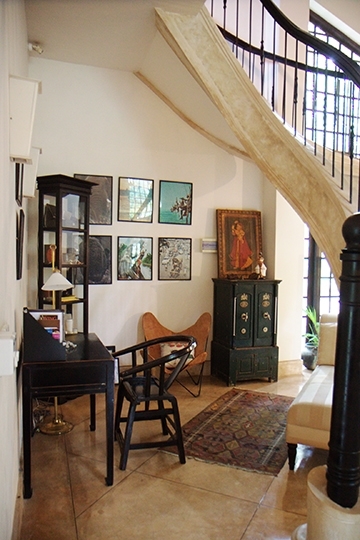 Galle Henna Estate dates back to the early nineteenth century and although extensively renovated, it still retains many period features such as pillars, archways, intricate fretwork, delicate stucco and gorgeous antiques that lend a colonial aspect to its character, despite the elegance of its contemporary interior design. The living room features a soaring timber ceiling and curved cement and mahogany staircase winding elegantly up to three bedrooms on the first floor. Despite this grandeur, comfortable cushion-scattered sofas, coffee tables topped with magazines, well-read books in cabinets and a scattering of artefacts make the house feel very much like home. The generous space both inside and outside of the property makes it highly attractive for families, especially as the beach is only a five minute drive down the road, whilst the two downstairs bedrooms are ideal for less mobile relatives. 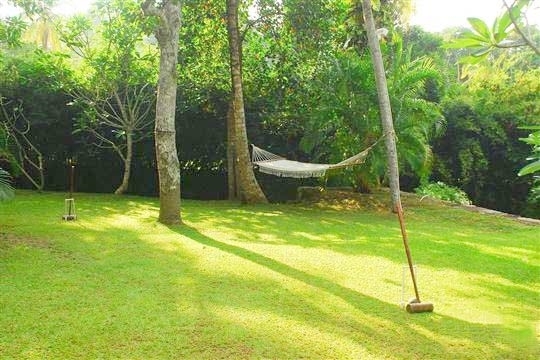 The house and garden are completely enclosed by a wall which provides both privacy and security while leaving the views of the paddy fields unhindered as the house stands on much higher ground. A little pathway leads across the front lawn and down to a sunken swimming pool with wide white terrace scattered with languishing loungers shaded by oversized parasols. A small fan-cooled pagoda is the ideal place for a long, lazy lunch. There are three members of staff at Galle Henna who keep the house in order but very much leave you to your own devices. 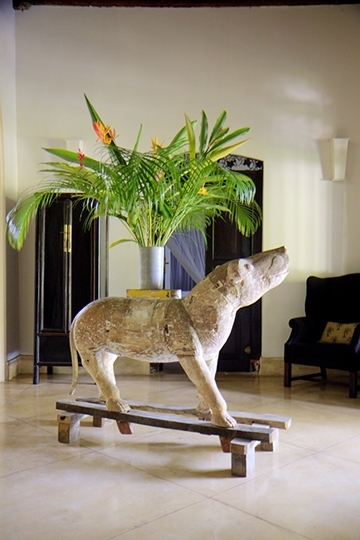 The manager cooks breakfast every morning, as well as other meals on request (on guest account), and transport to nearby beaches, restaurants, temples and Galle Fort can easily be arranged. 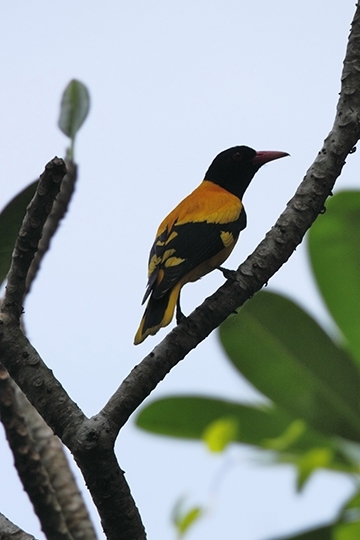 It’s a haven for nature lovers; birds and monkeys visit the garden. 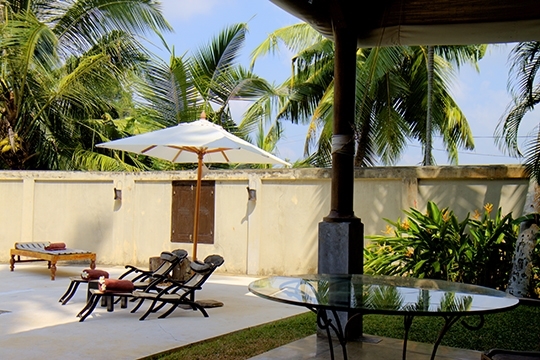 Galle Henna Estate is located in the sleepy village of Polheena between Talpe Beach and Heenatigala, a verdant jungly hill. 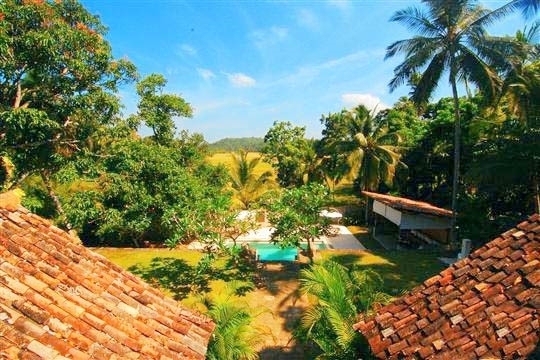 The setting is very rural with extensive paddy fields within view making you feel a lot more secluded than you actually are. It’s a very serene place to soak up the tranquillity and warmth of the countryside, although it’s only a five minute drive to the beach. 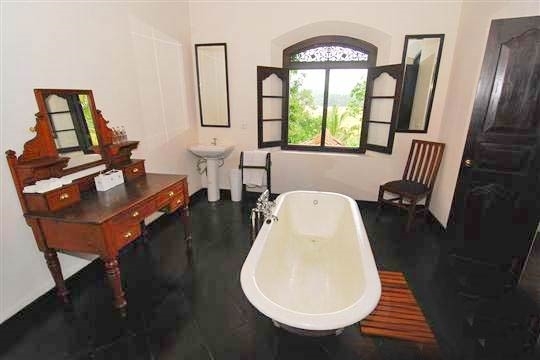 There are a couple of historic temples nearby and Unawatuna’s selection of restaurants, cafes, communications centres and basic shops are only five kilometres away. For banks and a more extensive range of shops, you can head to Galle (10km or a 15 minute drive). 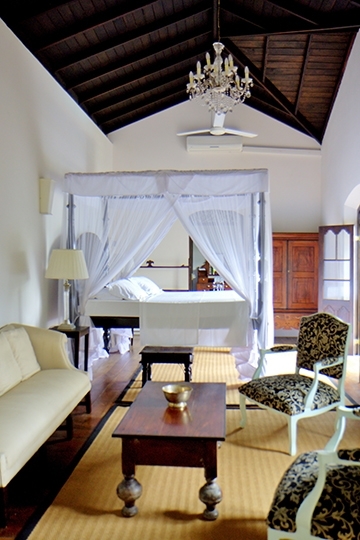 Escape Galle’s beaches and you arrive at an unspoilt oasis of calm where iridescent green paddy fields are bordered by overhanging palms and patches of jungle that hug hillsides and conceal homes accented by colourful bougainvillea, hibiscus and frangipani blossoms. Into this lush rural scene ancient temples such as Kathaluwa, Yatagala and Pilana are woven. During festival days, white-clothed devotees flock to these important places of worship with hands full of flowers and prayers on their breath. 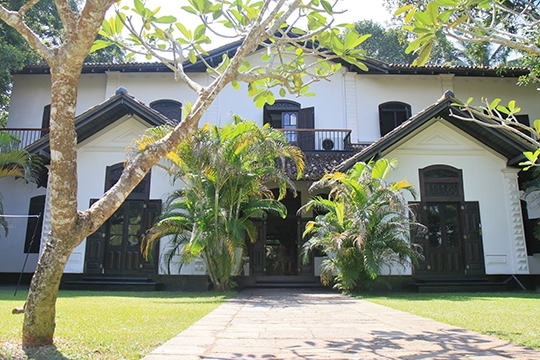 Narrow Dutch canals, mangrove swamps and bumpy hillocks add to the region’s verdant tapestry and its back lanes, paddy bunds and dusty tracks are best explored by bicycle as you meander your way from Galle’s hinterland towards the coast where the majority of the region’s eateries are located. Tea and cinnamon plantations, rainforests and jungle become more prominent the further you go inland. 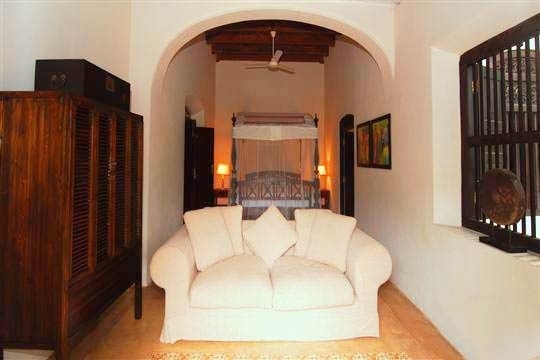 The gorgeous antique facade of the Galle Henna Estate with its original jackwood windows and doors has been beautifully preserved, and it is this that you walk through to enter the house. 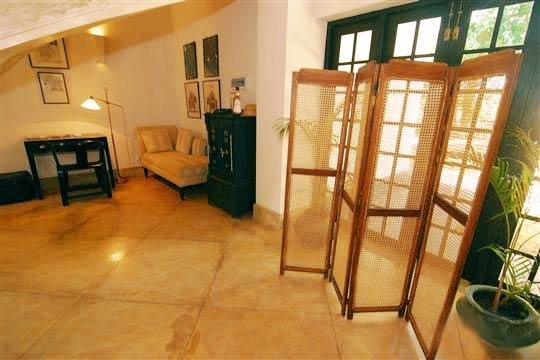 A few steps take you from the garden to the paddy-view porch that leads into a hallway with two double bedrooms off to either side. To the front is a huge open-plan living room with staggeringly high timber ceiling and sweeping staircase to take you to the upper floor. Sofas are scattered with cushions, coffee tables filled with magazines and an antique liquor cabinet stands invitingly open, displaying its sparkling wares. To either side of this room, glass window panels flood the room with light, whilst to the rear through a pair of twin arches is the dining area with table for eight illuminated by a pair of glittering chandeliers. 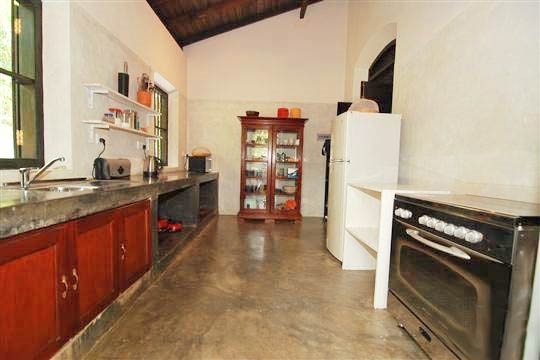 A bar leads off from the dining area to a well-equipped kitchen for self-catering. 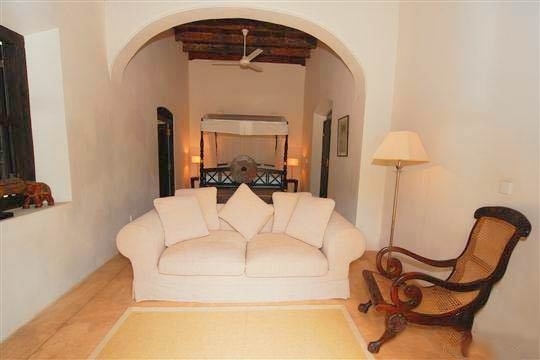 There’s also a verandah to the back with circular breakfast table for six. The two double bedrooms on the ground floor are similar in layout though differ slightly in design. 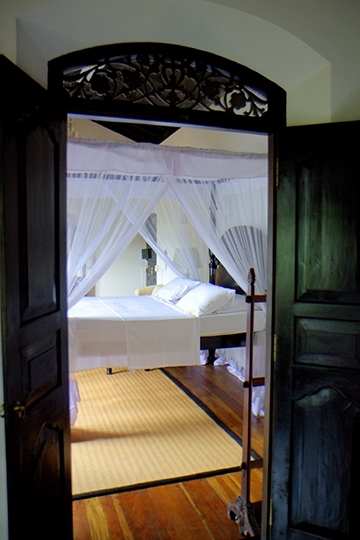 Both have jackwood four-poster queen-size beds draped in soft mosquito netting, both fan and air conditioning and a squashy sofa from which you can gaze towards the paddy fields through a second doorway onto the garden. Both bathrooms have a polished cement tub at the centre, as well as a rain shower, single sink and toilet. 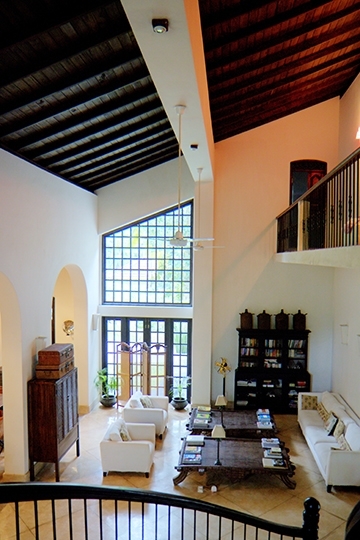 On the first floor are three bedrooms, each with polished timber floors. 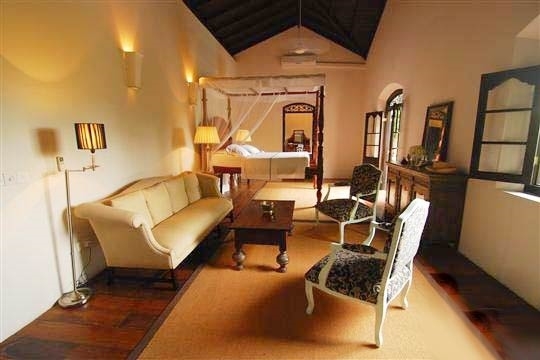 The master bedroom (with fans and air conditioning) is at the centre, and features a four-poster king-size bed so tall you need a step to climb onto it, a lounge area, French windows onto a private balcony overlooking the paddy fields and pool, and an ensuite bathroom with claw-footed cast iron tub, rain shower and antique dresser. 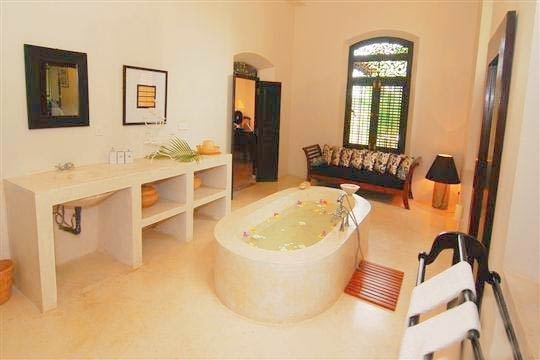 This room connects with a small fan-cooled double room, ideal for children, which has an open-plan (screened) bathroom with small tub and shower and a private front balcony. The fifth bedroom is also ideal for a child or for a single occupant. 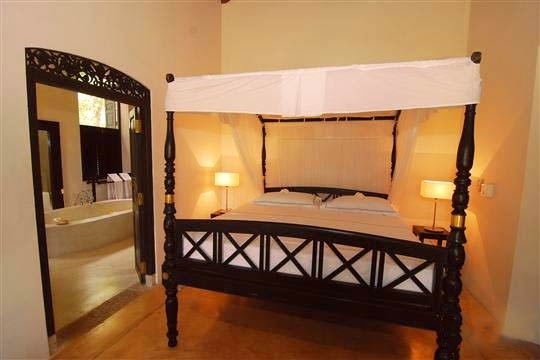 Fan cooled, it features a four-poster single bed, a private balcony overlooking the views and a small connecting bathroom with shower. 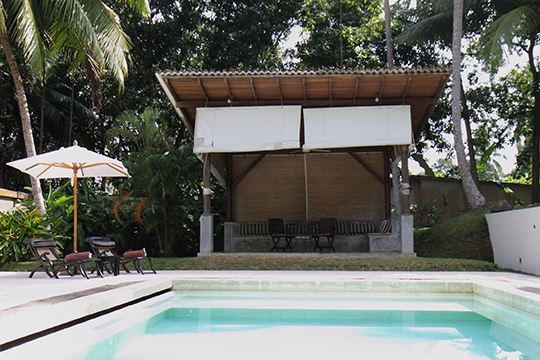 Out in the garden, next to the swimming pool, is a pagoda for dining or just relaxing in the shade under the fan. 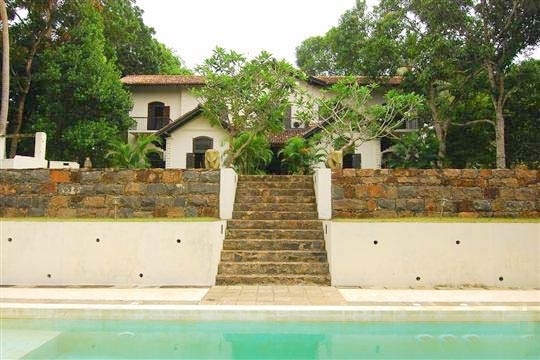 5 bedroom villa located in Inland Galle, South Coast. 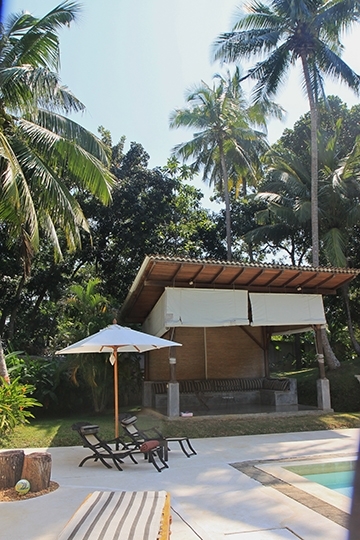 Ideal for Beach in ten, Body and soul, Bring the relatives, Kid friendly, Fair share for groups, Room with a view.